These folks are sending out news fast and furious. Here's the latest update. 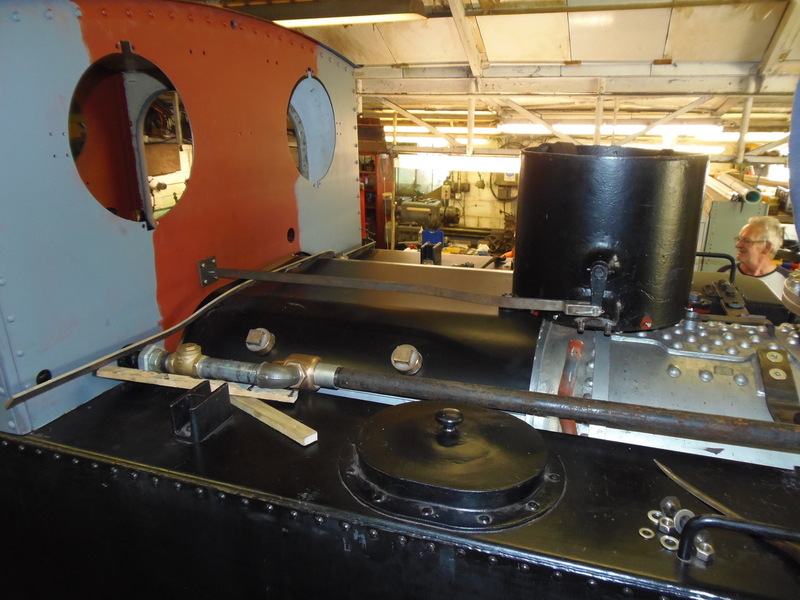 Note the boiler and firebox for the NG-10, a two-foot gauge Pacific. Also some cool photos of World War I "WD" locos in Great Britain. Be sure to check out the video clip under the "Road Steam" heading. It's simply amazing! That's really cool stuff! I didn't realize Baldwin built any of those 2-6-2T engines! I always just assumed they stuck with the 4-6-0T's, which seemed less practical for reverse moves. Looks like the Baldwin sits a little higher than the Alco. the 2-6-2s were designed and built by Baldwin, the other companies used their blue prints when they couldn't keep up. I wonder if anyone has ever asked the Army if they would loan out their engine for restoration and operation? A discussion of the WW&F's implementation of the Eames Vacuum Brake system has been moved to the members-only section of the forum. It's interesting that Alco built the outside framed version, while Baldwin opted for the less-steady-riding inside frame design. I think Baldwin only built two inside framed locomotives for the Maine common carrier two footers. B&SR 6 and Sandy River 16, later SR&RL 8. Both 2-4-4t's had a reputation for teetering along in an unsteady, top heavy manner. 8 even capsized at speed, killing her engineer. I would have thought such history would have prompted Baldwin to really push an outside framed engine for the military applications. Baldwin built 495 of those pannier tanked 4-6-0T engines for the British Government, 1916-17, weighing a bit over 16 tons each. They also built 280 of those little push-me-pull-me "Pechot" 0-4-4-0 lokies for the French, weighing in at about 14 tons, along with 20 tank engines of an American design and a bunch of gas-mechanical engines. All told, they built over 1000 60cm locomotives for the french alone! These totals don't even count the 2-6-2T's and gas lokies built for the American Efforts. War is expensive in so many ways! It would be interesting to find out how many outside frame locomotives of all sizes Baldwin build in their entire history. Much nicer cab on that Moroccan engine! I believe I have seen a photo of a 2-6-2T with a similar cab.